The 7.62 Triple Shingle is a 7.62mm sized version of our best-selling M4 Triple Shingle. 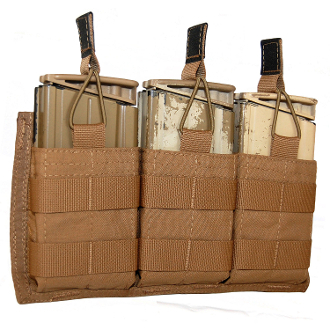 Each pocket is sized for an M14/M1A, SR25, LR20, SCAR-H or FAL/L1A1 magazine. This pouch also has two rows of PALS webbing on the face to stack shingles or add smaller pouches, like the ATS Leatherman/Surefire/pistol magazine pouch or a roll up dump pouch. It measures about 10.5 inches long and about 6 inches tall, and uses 6 channels and 6 rows of MOLLE space. Magazine retention is accomplished by a bungee retainer and pull tab with SureGrip material on the tab itself.